Haley Skarupa found herself all alone in the slot staring at a wide-open goal. Quickly cradling the puck, she unleashed a low wrist shot labeled for the left-hand corner. In an instant and seemingly from out of nowhere, all-world goaltender Jessie Vetter lunged to her right and kicked out the toe of her skate to rob Skarupa of a sure goal. Now the Boston College sophomore knows what the rest of the world feels like. 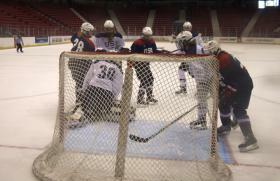 After three days of team meetings, individual testing and on-ice practices, the U.S. Women’s National Team Selection Camp kicked it up a notch on Wednesday with the first of four intrasquad scrimmages at the Herb Brooks Rink in Lake Placid, N.Y.
Not that anyone was counting, but Team Blue notched early bragging rights with a, 2-1, overtime victory on a goal by promising young defenseman Jincy Dunne. Anne Pankowski (Team White) and Amanda Kessel (Team Blue) scored 37 seconds apart in the second period for the game’s only other goals. “You have 41 of the best players here and you could tell tonight that it was a great game that went back and forth the whole time,” said Vetter, who split the Team Blue goaltending duties with Brianne McLaughlin. 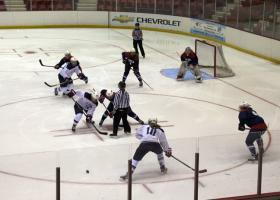 Assembled here in this quaint Upstate New York town, the scene of the 1932 and 1980 Olympics, are 41 of the top U.S. women’s hockey players, including 13 who represented the United States at the 2010 Olympic Winter Games in Vancouver. 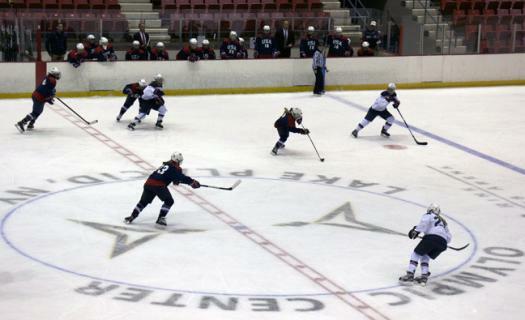 Coaches and staff have the unenviable task of paring down this list to 25 players who will become the 2013-14 U.S. Women’s National Team that will have the inside track on one of the final 21 Olympic roster spots. In addition to taking up residency in Boston, the group will embark on a scaled down tour that will include a number of exhibition games against Canada, including a confirmed date in Grand Forks, N.D., on Dec. 20. These North American rivals have captured every Olympic gold medal since women’s hockey became an Olympic sport in 1998. After the U.S. won the inaugural gold in Nagano, Japan, the Canadians have owned the top of the podium in 2002, 2006 and again in Vancouver. It is a trend the U.S. coaching staff is determined to reverse, and it starts with creating the right mindset here this week. “Canada is obviously really good. They’re our biggest opponent. Playing with and against each other will definitely help us prepare for when we do face them,” said Skarupa, who has played on three IIHF Women’s World Under-18 Championships in addition to several other tournaments with the older squad. For both the newcomers and veterans alike, this week is the ultimate job interview, with coaches and staff watching their every move leading up to Monday’s National Team announcement.